The streaming-video giant's new finance chief faces some major cash flow and debt challenges. The new chief financial officer that Netflix (NASDAQ:NFLX) just hired has all the right resume credentials, having served as CFO of Activision Blizzard and in multiple positions at Disney over the years. But Spencer Neumann joins the streaming-video giant at a thorny time for the business, with most of its biggest challenges falling squarely in his purview. Netflix in mid-January will likely announce that membership levels -- and earnings -- soared in fiscal 2018, but that the company also tore through billions of dollars of cash in the process. That's just one of the issues that the CFO will have to tackle as he takes charge of the streamer's finances. Let's take a look at what might be sitting in the executive's "to do" pile in 2019. Netflix executives take issue with Wall Street calling its annual cash outflow a "cash burn." That's understandable. After all, the spending is directly tied to the production of original content, which has proven to be a blockbuster growth driver for the business. Netflix is on track to post its fifth straight year of accelerating membership growth and investors can thank its original content strategy for much of those gains. In that way, the cash allocation is simply a down payment on future gains in subscribers and higher average monthly prices to come. Still, it's distressing to see a growing business go through so much more cash than it generates. 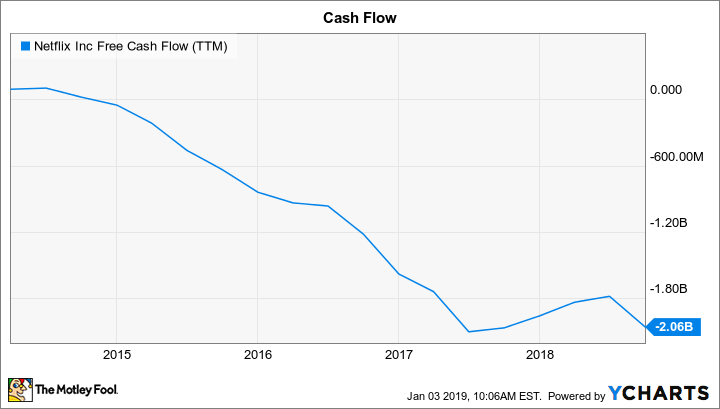 Neumann and his team will have to take a hard look at those investment priorities as the company crosses $3 billion of negative annual free cash flow. Netflix's debt burden shot up to $6.5 billion in 2017 from $3.4 billion the prior year. It expanded even further through the company's issuing of $4 billion of bonds in 2018. There's room for debate about the right level of debt that the company should target, and the incoming CEO should have a strong opinion on the topic. Executives in the past have pointed to Netflix's market capitalization as demonstrating plenty of flexibility for debt growth. However, its recent stock price swoon illustrates how unreliable that indicator can be. As a shareholder, I'd prefer to see the company hold itself to a more conservative standard that looks at debt costs as a percentage of profits, for example. Netflix hasn't updated its outlook on annual content spending yet, but it's a safe bet that the figure will approach a whopping $10 billion in 2019, up from around $8 billion last year. The company has had a mix of hits and misses on this score recently, with wins like Bird Box and Christmas Chronicles far outweighing the occasional flop and canceled show. But the stakes are rising as its content ambitions grow. And eventually Netflix will reach the point when these investments aren't delivering a high enough return. The new CFO will have to be ready for this potential shift and will have to do what he can to protect the company from overspending in the meantime. That challenge is made tougher by the fact that Netflix is producing -- and paying for -- content today that in many cases won't hit its streaming servers until early 2021. If the company has far more than its current 150-million-member base at that time, and pricing stays strong, then even its biggest TV and movie bets should pay off. Yet there are many ways the future could play out less favorably for the business, and it's the CFO's job to prepare for all of them.